Highlighting expert assistance available when establishing a new laboratory or expanding an existing facility. There are a number of reasons why an organisation would wish to set up an in-house test laboratory. How, though, can a laboratory be set up to ensure that the tests are meaningful and can be conducted accurately and consistently? Drawing from its extensive experience, SATRA can offer a comprehensive, integrated package of advice, test equipment, training, calibration and accreditation for establishing or extending a laboratory tailored to individual customers’ requirements. 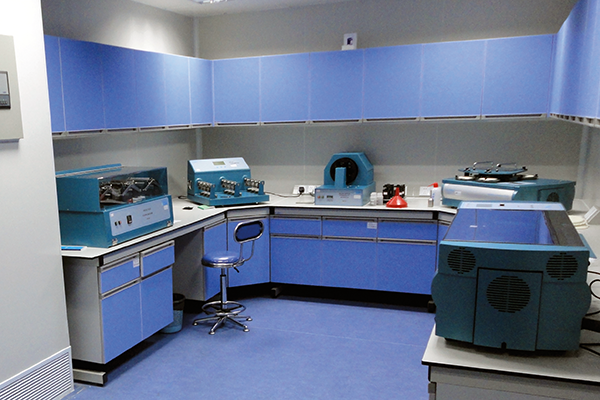 Test laboratories are operated by a diverse range of organisations connected to the footwear, leather and associated industries, including brands, retailers, manufacturers, component suppliers, material suppliers, independent test houses, research institutes, industry associations, government institutes and universities. SATRA has worked with all of these types of organisations in many parts of the world to assist with the establishment or development of their test laboratories. This article outlines a new SATRA initiative to offer a comprehensive service, bringing together a number of current SATRA services to give an integrated solution for the creation and operation of a new testing laboratory, or the extension of an existing laboratory. Testing is more than having a test laboratory full of test equipment. To be effective in offering meaningful testing outcomes, consideration also needs to be given to i) the quality systems by which the laboratory operates, ii) the training and capability of the laboratory team, iii) the test methods employed, iv) the type, quality and condition of the test equipment and all associated accessories for preparing samples and conducting tests, v) the quality of the consumables employed, and vi) the laboratory environment (for example, temperature and humidity). These aspects are, of course, in addition to the expertise required to present and interpret the test results. Before considering what is required for a laboratory in more detail, it is worth reviewing why in-house laboratories are developed in the first place. The reason will vary, depending on where the organisation is within the supply chain. Brands or retailers will often establish an in-house laboratory for a number of reasons. These may include the ability to audit products coming from suppliers as part of a quality control system, benchmark their own products or those from competitors, validate new products, materials or processes, and promote their commitment to quality and product development to their customers and, hence, support a brand image. For a manufacturer or component supplier, reasons for establishing an in-house laboratory may include demonstrating compliance with legislative or customer specifications, helping to control a critical manufacturing process, benchmarking products and validating product development. In addition, manufacturers or material suppliers will often promote their commitment to quality and product development having established an in-house laboratory. What experience can SATRA draw on to contribute to the establishment of an in-house laboratory? SATRA has a long track record in conducting fundamental research. A comprehensive range of SATRA test methods has been derived from such research, together with the design and manufacture of the associated machines used to conduct these tests. SATRA test methods are used widely in the global footwear industry, and have provided the basis of many international standards. SATRA has many years’ experience in the design and manufacture of test equipment, and supplies over 300 different types of machines and devices which are built in the UK and delivered to some 70 countries worldwide. SATRA also has extensive testing experience conducted in SATRA’s own test laboratories, coupled with a very broad experience of footwear construction and manufacturing methods. This gives SATRA an unparalleled ability to identify appropriate tests used to validate the quality or performance of footwear materials, components, and whole footwear. In addition, SATRA has many years’ experience in training within the global footwear industry, including instruction in the use of test equipment and devices, sample preparation, and how to conduct tests and establishing quality operating systems within a laboratory environment. SATRA’s quality services team calibrates laboratory equipment in addition to implementing SATRA’s widely recognised laboratory accreditation programme for SATRA members around the world. This may involve working with the customer to implement a formal quality assurance-based control system for the laboratory and associated staff training, after which a formal assessment of the procedures and staff competency is conducted. This begins with a number of questions. What is the overall objective for the laboratory? What type of testing is envisaged – for example, quality control auditing, new product validation, compliance with legislation/customer specifications, exploratory or benchmarking? What types of products are to be assessed (such as materials, components or completed products)? In what categories – for instance, men’s, women’s, children’s, everyday, fashion, casual, sport, safety, indoor, outdoor or military? What individual properties are to be assessed, if known? SATRA can also recommend which properties should be assessed, and these often complement customers’ requirements. Having established the answers, SATRA can advise on appropriate test methods, the required test machines, sample preparation equipment and accessories in order to conduct these tests. In addition, for SATRA members seeking accreditation, SATRA can provide, if required, a template for a full set of laboratory control procedures to help establish the effective operation and quality controls within the laboratory. In setting up a new laboratory, decisions have to be made regarding the environmental conditions required within the laboratory. The SATRA accredited laboratory scheme recognises two classes of laboratory. A SATRA B-grade accredited laboratory requires only the temperature to be controlled, whereas a SATRA A-grade accredited laboratory needs both temperature and humidity to be tightly controlled. Consideration also needs to be given to the conditioning of materials, components or completed footwear prior to testing. It is worth noting that not all tests need to be conducted in a controlled environment. This varies from test to test and is set out in the individual test methods. SATRA can advise on the environmental conditions and also work with the customer to establish the specification for the laboratory facilities and conditioning which would be given to the contactor for quotation or commissioning. SATRA is also able to confirm suitable sizes for the laboratory areas taking into account the selected test equipment, the requirements for a conditioned area, sample conditioning and sample preparation. Having determined the size of the testing areas required, SATRA can assist with the specification of other aspects of the laboratory, including lighting, power (electrical and pneumatic), workbenches, washing areas, flooring and storage racks. SATRA test machines allow many different types of tests to be conducted, particularly in relation to the footwear, leather, leathergoods and safety products industries. This equipment has been designed and tested to ensure that SATRA test methods and many international test methods can be conducted accurately. In addition to the supply of test machines, SATRA can recommend the ancillary items required to prepare samples and conduct tests. Test methods can be supplied along with the test equipment. 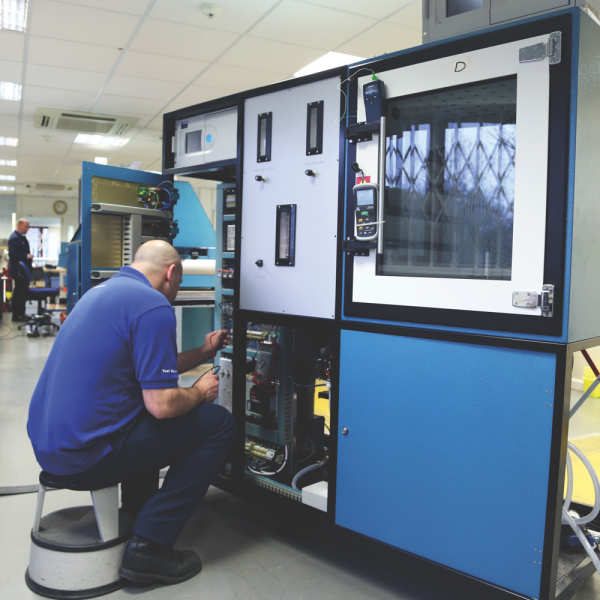 An important contribution to providing consistent testing results is to ensure that test machines are correctly maintained and in good working order. SATRA has a long track record in the supply of quality equipment to a global market, supported by a network of agents and a head office technical support team to ensure that test machines give many years of consistent and accurate test results. In conjunction with the supply of SATRA test machines, SATRA can provide training in the use and routine care of equipment, the preparation of samples and in conducting tests and understanding test results. For SATRA members, we can also supply training for setting up and operating the laboratory control procedures as part of the SATRA laboratory accreditation process, which is explained later in this article. Having a well-trained laboratory team is very important to ensure that tests are conducted correctly and deliver meaningful outcomes. Good quality training is often overlooked when setting up a laboratory, yet is as important as the facilities and the test equipment installed. Another important contribution to the accuracy and consistency of test outcomes is the quality of the consumables and reference materials used. SATRA supplies a wide range of quality consumables and reference materials. There is a strong temptation to use the lowest-cost consumables available in the market. However, these often cannot be relied on and can give inaccurate testing outcomes. Having invested in the laboratory facilities, the test machines and training of the laboratory staff, the quality of the testing outcomes can be undermined by the use of low-cost consumables of uncertain performance and consistency. By contrast, SATRA consumables are reliable. In order to maintain accurate testing outcomes, it is important to ensure that test equipment remain within its calibration parameters. 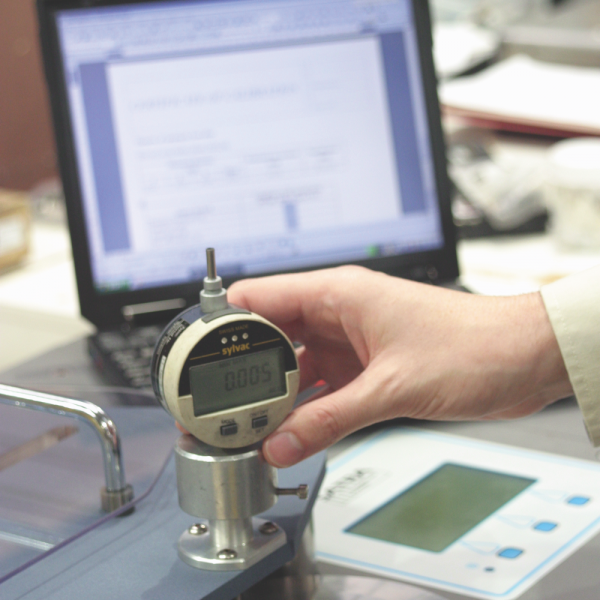 SATRA has many years’ experience of providing a calibration service to a global market. This service is provided by a dedicated team and benefits from world-class expertise in developing test methods and test machines, as well as many decades of testing experience within SATRA’s own laboratories. Calibration is often carried out for SATRA members as an annual calibration in conjunction with an annual accreditation visit. SATRA’s laboratory accreditation service for SATRA members is often specified by brands and retailers for their supplier laboratories, although it is also taken up independently by many laboratories. The accreditation process covers a wide range of aspects for the laboratory operation, including laboratory environment, test methods and standards, test equipment, testing plan, staff training, maintenance and calibration, reference materials, progress of work, reporting, retention of records and test specimen retention. The formal assessment visit includes the facilities, procedures and staff competency. Following a successful assessment, a SATRA accredited laboratory certificate listing the methods covered is issued for the laboratory. Separate certificates are issued for each individual staff members, listing the tests against which they have been individually successfully assessed. In the process of achieving accreditation, it is not unusual for corrective action sheets to be issued detailing the areas of non-conformity. Depending on the severity of the non-conformance, the corrective actions can either be dealt with by correspondence or additional visits may be required. A chain is only as strong as its weakest link. As explained in this article, setting up a laboratory or expanding an existing facility requires a number of important ‘links’ to be forged together. SATRA has the experience, products and services to be your development partner for the establishment of an effective testing operation. In addition, and as previously mentioned, SATRA members also have an opportunity to achieve SATRA accredited laboratory status. Click here for comprehensive information on SATRA's range of test equipment. Please contact quality.services@satra.com to discuss how SATRA can help you with the establishment of a new laboratory or the expansion of an existing facility. This article was originally published on page 38 of the September 2014 issue of SATRA Bulletin.